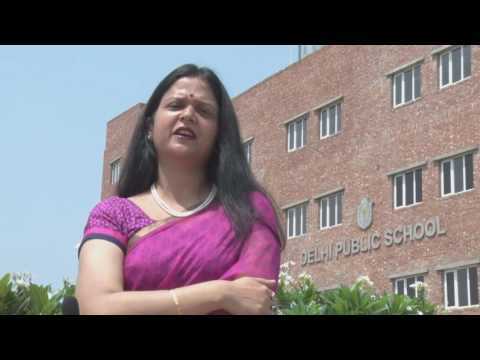 The motto of Delhi Public School is a vivid reflection of the mettle and dedication that goes into the making of a noble institution with a noble mission. To provide a happy caring, supportive and secure environment. To inculcate values central to the ethos of the school and the community. Prizes will be awarded for academics to students section wise as follows. The student will fully respect the school'sendeavor to promote integrity and ethical behavior on all fronts. The hub of all extracurricular activities, this block will have art and craft rooms, dance and music theatre, two libraries, science labs, computer labs, counsellor'sroom, Principal'soffice and administrative rooms. The spacious and airy classes especially designed to meet the requirement of Nursery to Class Five for group activities like story telling etc. Connected to the block will be a Toddler'spool. Wide corridors and open spaces for children to move around. Well connected with the Cultural Block, this block will house the students of classes VI to VIII. Connected to this block will be an Amphitheatre to hold activities outside the classrooms. Will have classes IX to XII. The connectivity from all floors to the Cultural Block will enable students to move smoothly to the Labs and to the other parts of the school for extracurricular activities. The air conditioned, 10,000 sq ft. hall will accommodate 1500 students to partake in a large spectrum of sports and extracurricular activities. It will also support a wide range of indoor sports such as Table Tennis, Gymnastics, Badminton, Chess etc. To ensure smooth transportation of children to and from school, Air Conditioned School Buses will be provided at strategic stops. 1. We truly appreciate the initiative taken by the school to send the children to an educational tour to Jim Corbett National Park. The trip was excellently arranged and my daughter - Ms. Sai Vedhika (VI A) enjoyed it very much. She narrated the care taken by your team. We really appreciate the care and concern extended by the team when the kids stayed in the resort. Kudos to the entire team!! 2.First of all, Please accept my kind regards to you and also let me take the opportunity to thank you for joining DPS community. I personally am very satisfied with the trip of my ward. Nitin Sir, Bicky sir and Neerja Mam all folks have been a great help during the tour. I hope such tours are organized more frequently. Mam, since you came onboard I see several positive changes and seeking such feedback is one them. The tour was relay amazing, My child was very excited before going and even more excited after coming back home with lovely unforgettable memories. We are very happy for organizing these type of educational school tour and hope that the children of DPS R.N. Extension gets more experience. 4. I want to express my heartfelt gratitude, after witnessing the grand spectacle of nationalism. The event has reinforced our belief that DPS, Indirapuram, Meerut Road Campus is the pioneer educational institution of India. 5. The programme was really good. We are very happy with the school management. Director Ma'am'sspeech was outstanding, very motivating and inspiring. 6. We are short of words to express our gratitude. I was overwhelmed to see my kids perform so well.I'm sure the platform provided by the school will take my child to greater heights. 7. The programme was very interesting. A good platform for the children to learn and grow. Please keep organizing such events. 8. The programme was amazing and we could realize that the school is doing well not only in education but also in co curricular activities. 9. The programme was very effectively organized. I got emotional watching my child perform on the stage. 10. The function ‘Incredible India' was very well organized. I appreciate the efforts of all the teachers and staff members. 11. We are overall satisfied with the efforts that the teachers are putting in for the overall development of the child. 12. I can see a vast change in my daughter'scommunication skills, confident, etc. Thanks a lot for guiding and supporting her in all the spheres. We feel proud to be a part of DPS Indirapuram, Meerut Road Campus. 13. The event "Incredible India" was a huge success. Thanks and congratulations for putting such a wonderful show. 14. It was a great show. Please do take initiatives for organizing such wonderful events. Hard work put in by the staff members is appreciable. May god bless this team. 15. It was an amazing experience. The event was a flawless showcase of talent and the performance of the children were much appreciable. It has been aesthetically designed by a firm of UK based architects(ADP Architecture.) DPS Indirapuram Meerut Road Campus pledges to provide value based, holistic education, strongly supported with the latest technology and the best pedagogical practices with highly trained teachers and administrative staff.